My weekday afternoons are all kinds of busy, but some days are really crazy with everyone coming and going at different times. On those days, dinner needs to be extra quick & easy! So I made an old stand by … a Veggie Quinoa Stir Fry. It’s simply any mix of vegetables you have on hand, sautéed in avocado oil, a touch of Toasted Sesame oil & salt, then mixed already cooked Quinoa, and topped with avocado, scallions & a handful of pistachios. That’s it! Super adaptable to tastes and really yummy! 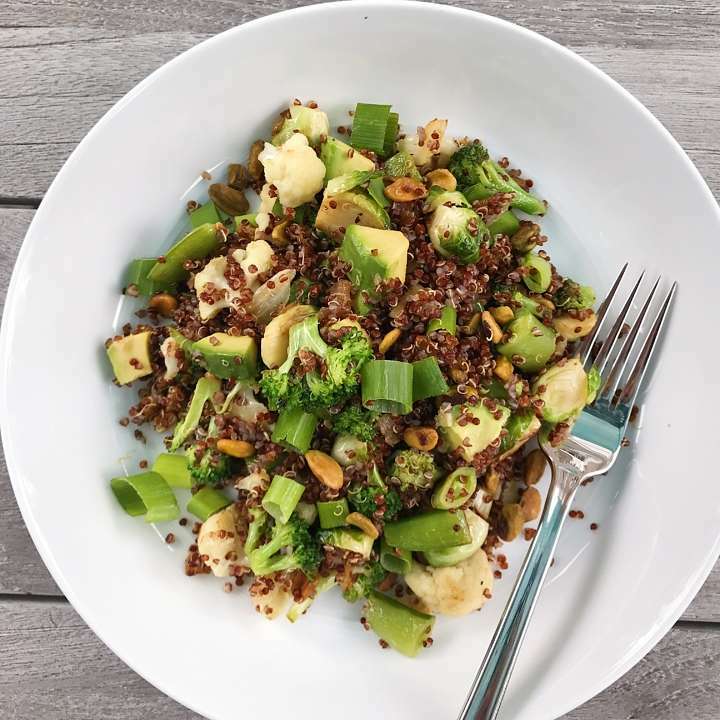 There is no quicker meal or side dish than a Veggie Quinoa Stir Fry. It's simply sauted vegetables tossed with already prepared quinoa. Adaptable to tastes or whatever vegetables you have on hand. Delicious warm or cold, it's also great on the go or for lunch the next day.